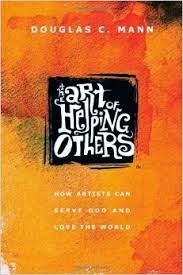 The Art of Helping Others: How Artists Can Serve God and Love the World by Douglas C. Mann - I picked this book from Speakeasy because I am an artist myself. I really enjoyed it and many of the words went into my quote book. Mann is an artist who believes art can heal and help bring disadvantaged people together. I believe this too. He brings forth the idea of "creative incitement," restorative acts reconciling lives wherever and whenever the spirit leads (11). Creative inciters are those willing to embrace the role of risk taker, people willing to be agents of change and a driving force (35). I found this book to be very inspirational with its call to action and authenticity. I like that his definition of Christian art is not based on the content, but rather on its intention and outcome: "Christian art is not primarily a matter of form (e.g. biblical imagery and worship music), but a posture toward the world that bridges the divide between Creator and creation, flowing out of God's mission for us (94)." He says that ultimately the definition of art is, "to affect the quality of the day, that is the highest of arts (36)." Jesus was an artist, Mann asserts, for Jesus "worked to creatively reveal truth, inspiring people with wonder and engaging their minds to get them out of the way of their hearts," and so artists that strive to do the same are followers of his way. "Christians are meant to be artistic oddities that draw others to God," he says and I wholeheartedly agree. Mann reminds us that Christians are not meant to be living a life of complacency, but should be stirring people up to see the injustice around them and help bring compassionate justice to it. "How refreshing it would be to see artists of faith considered dangerous to the powers that be because they're activiely involved, engaging and influencing the society around them" (94). How refreshing indeed. Unfortunately, social change is not the first thought I have when I think of the terms Christian artist, but annoying nuisance or sanctimonious piety - this needs to change. I recommend this book to any Christian artist or simply any person who wants to get charged up about their faith and how to put it into action. There's a great list of resources at the back of the book. My only complaint is that the artist's paintings were not in color. I am happy to report that this past Thursday, I came to realize that my own artwork creatively incites people-the altered book that won the award at SkyLand Trail inspired everybody so much that they decided to make their own. They spent a whole six weeks working of their books-more time than they have ever spent on an art project! I am going to submit it to another art contest for people with disabilities, which is very exciting. It is so gratifying to know that my work is helping and inspiring other people, just like it is helping me. Right now, I am working on another altered book called, "My Dating Rules" and it is an intentional way for me to set my mind on how I want my dating life and potential relationships to be like. I will post pictures when I done! Be a creative inciter! Don't just sit there, but do and do good! Be an artistic oddity that draws others to God.